The book is divided into the types of documents Van Maele's artwork is found: Books, Portfolios, Periodicals, Cartoons, Bookplates, etc. with each title linked to an example of the artwork (where possible). Most of the entries in the book contain full bibliograpical information, many with annotations related to the title, author, etc. 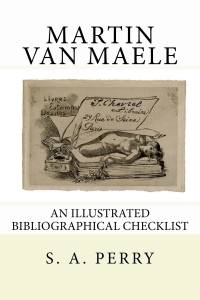 In addition, there are biographical sketches of Van Maele (with copies of supporting documents: birth, marriage, and death records, gravestone photo), Charles Carrington and Jean Fort, and a short title list by year. More than a checklist but perhaps less than a full-on bibliography, this work is as complete as I have been able to make it after years of research. However, it IS a work in progress. Martin Van Maele's erotica illustrations were often unsigned or signed with a pseudonym, done in very limited editions, with the publishers of his work being just as elusive; making it all the more difficult to ever define this list as complete.